‘The magnitude of the blow suffered by the UK economy since the beginning of the financial crisis is very considerably minimized by not presenting it in terms of a common international yardstick. Gauged by decline in GDP, using a common international purchasing measure, dollars, no other economy in the world has shrunk even remotely as much as the UK.’. 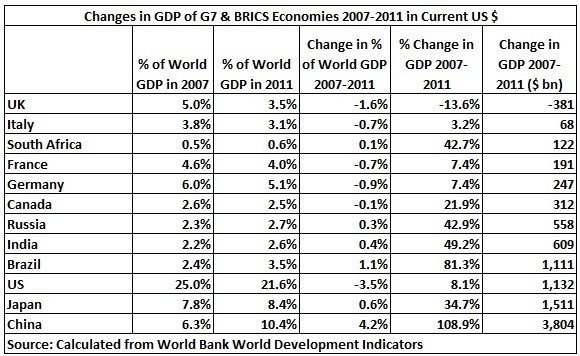 Taking first the situation of the world’s major economies, the G7 and BRICS, this is summarised in Table 1. 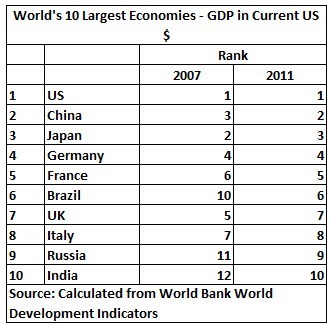 The comparison made is between the last year before the financial crisis started, 2007, and the last available comprehensive international data – for 2011. As may be seen the $381 billion decline, in current dollar terms, of UK GDP is, without comparison, the worst of any major economy – indeed it is easily the worst in the world. As a percentage of world GDP the UK lost 1.6 percentage points – easily the worst performance of any European economy.The advance of all BRICS economies is also clear from this data. However, as is well known, current exchange rates substantially understate the size of developing economies compared to calculations in internationally equivalent prices (Parity Purchasing Powers – PPPs). 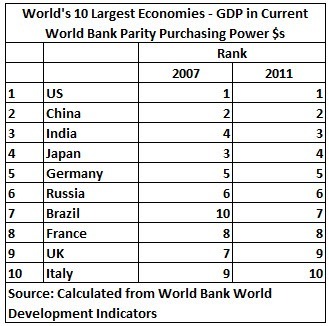 This is particularly strikingly the case for India which at current exchange rates is only ranked 10th but in terms of PPPs in 2011 overtook Japan to rank as the world’s 3rd largest economy . In PPPs the UK has declined from 7th to 9th position – also being overtaken by France and Brazil on this measure. In this edition of On the Edge, Max Keiser interviews Steve Keen, economist and author of the book Debunking Economics. He says that debts have spiraled out of control and the reason is shadow banking system. 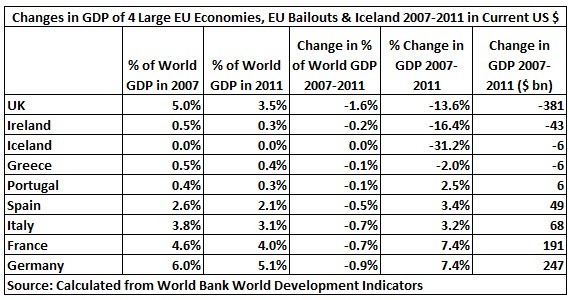 The program touches on the correlation between the US-EU debt crisis and the worsening Greek economy.